This holiday, deck the halls with bells of holly and deck the kids with H.A. costumes! We have, without a doubt, the widest range of children’s Christmas costumes out there, so you’re to find an outfit that fits your little ones’ desires. Maybe your little one doesn’t want to be Santa. This year, he’s all about being different! Our Gaspar Wise Man Costume is the perfect outfit for him. With its gorgeous multi-colored embroidered robe with shimmery detail and matching fex hat with gold tassel, this outfit proves that children shouldn't just be seen, they should be heard and listened to! Your boy will look absolutely adorable in this getup, and it'll look great as a father-son duo. May the wise ones be worshipped! 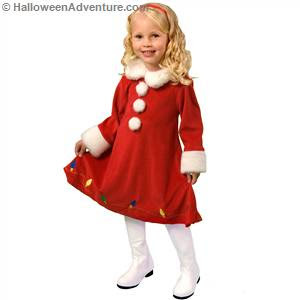 Little ladies will love our Little Miss Santa Costume. Attention, ladies and gentlemen! Little Miss Santa has arrived! This delightful little girl in a gorgeous red dress has come to announce Santa's presence (and presents!). She claims he'll be flying over our homes this very evening, and in a dress like that, we can't very well doubt her! The girl clearly knows her stuff! Toddlers will adore our Little Pig Costume. This little piggy went to market, this little piggy stayed home. This little piggy had roast beef, this little piggy had none. And this little piggy went whee, whee, wheeeee, all the way to Santa's workshop! 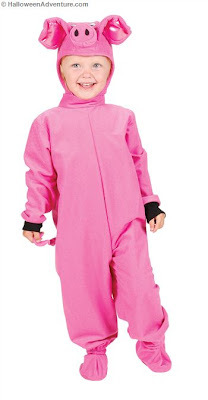 Our adorable toddler Piglet costume is bound to please with its bright pink color and comfy fit. With warm footies and a piggy hood, your tot will feel good and look good! Oh, Mary Mary! This beautiful Mary Child costume announces the arrival of Jesus better than any dress we've ever seen. It looks perfect paired with a Balthazar costume, and it's so close to the real thing you might swear your family has gone back in time. The dress is made of a light blue satin material that keeps your child covered and warm in the late December air, and includes a matching blue satin headpiece. Got a family full of wise ones? Snag the Gaspar costume above and pair it with our Melchior Child Costume. It’ll be two peas in a wise man’s pod, and it’s sure to attract your family the best kind of attention. These costumes are made with great attention to detail, and they’re beautiful! For more holiday costume ideas, head over to Halloween Adventure’s online store. Happy shopping!